When words alone can’t express all the ideas we have, Microsoft PowerPoint presentations are the superb companions, indeed. In the course of time, it has become common in the world of business, education along with other areas where persuasion is required. Although we’ve had better and worse alternatives, you would have no trouble in creating a convincing presentation with the help of PowerPoint. It doesn’t mean that any PowerPoint presentation would do the job. 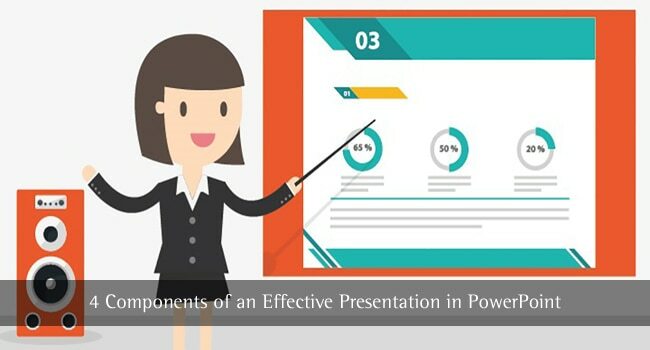 There are a few things you should understand and apply if you’d like to have the perfect, effective and persuasive presentation in PowerPoint. If you’re someone who’s new to the entire concept of professional presentations, there are a few things to learn too. This article is actually a guide that helps you create the most effective PowerPoint presentation, regardless the subject. To keep things simple and effective, we’ve brought everything under 4 points. Alternatively, we can say that the following 4 components are the crucial pillars for a successful presentation. And we have a few practice-oriented tips that will enhance the persuasiveness and reach of your session. While the tips are general, a few changes may be required according to the topic. For instance, you cannot use the same types of designs and typography for a professional and an educational presentation, right? So, shall we start? We believe that you have a set of ideas that should be presented to the audience. Obviously, it’s not right to scramble all of them somewhere and present the gist. There must be a proper order by which all the ideas and sub-ideas are brought before an audience. Only then will they be able to understand what you really want to say — that’s the whole thing about persuasion, you know. The introductory ideas should be placed first, and they are to be followed by the ones of relatively less importance. It’s the same philosophy for structuring your presentation in PowerPoint, too. The first slide, which is where you begin the journey, should convey your core topic and why it’s relevant. It is then the turn of sub-categories and peripheral slides. You should not just jump into the topic. A convincing introduction should enhance the impact of your presentation and make it sound more authentic as well. To cut the story short, it makes sense to stick onto the introduction-body-conclusion thing here, and you should also use some interlinking elements. As we mentioned earlier, the sole point of including a PowerPoint presentation is to bring the visual impact. So, you should take an effort to make sure that you have chosen the right visual elements for your slides. If you have many slides in the presentation, there’s a better option than individually designing all the slides — using some free PowerPoint templates, which would make the task so much easier. In some templates, you can find different slides with different purposes too, which is a great thing. There are a few things to note when it comes to choosing the templates. You should not pick the extremely colorful ones. Keep in mind that the PowerPoint slides are meant to accompany your presentation and not to distract your audience. If you ask us, we’d recommend the use of low-key colors, and even a minimal line of design. If you are planning to use images and videos, make sure that they blend with the background and the total profile of slide. Brevity is the first thing you should consider when it comes to preparing the presentation content. Not many people like to read what is written on the screen; if it was the case, you could have handed out some paper sheets, right? So, never try to stuff the slides with a lot of content. First of all, it would make the slide look so big and unreadable. Second, you will have a tendency to always look at the content and read it out, other than using your presentation skills. You must also bring an effective proportion of text content and visual element. If you think there aren’t any buzzwords to take care of, it’s recommended to go for full-visual slides. However, if you are doing it for some educational purposes, it becomes essential to include some text. Even when going for that, make the words as shorter as possible. No one compels you to use complete sentences in a presentation. If you can say same things in two words and twenty words, go for the two-words version of it. It’s pretty clear that a well-made PowerPoint presentation can help you make the session more persuasive, impressive and more. However, despite all the good stuff, there is something to be noted: you should never let the PPT ruin your total presentation session. In other words, there should be enough efforts from your side to avoid death by PowerPoint. In most cases, it happens when the slides are too heavy and the audience is unable to comprehend what’s on the screen. As we said earlier, you should use PowerPoint as a visual tool only. If you have something to count on other than your memory, there can be some simple bullets or headings. Thereupon, you can also give contextual information on the topic being discussed. Besides these, your slides should be as simple as possible and it’s recommended to have some simple designs. You should also apply some moderation when it comes to using animations and transitions. Apart from the tips we’ve suggested, these four sections can decide the total effectiveness of your PPT slides. This is important when it comes to business presentations, because the idea is to convey your ideas as well your proposals. 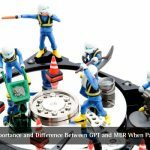 So, when the next presentation comes, make sure that you use the above-mentioned set of resources and get the best results in the end. I am very fond of Microsoft tools, after starting making videos in windows movie maker using powerpoint slides it is way more easy to use those slides for making perfect videos for our business promotion.